This artist's concept shows exoplanet HD 189733b orbiting its yellow-orange star, HD 189733. 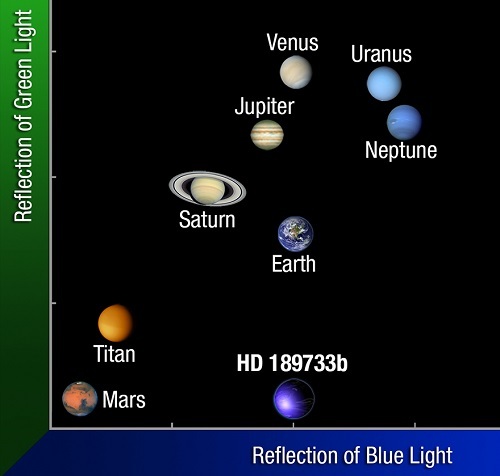 NASA's Hubble Space Telescope measured the actual visible-light color of the planet, which is deep blue. Astronomers making visible-light observations with NASA's Hubble Space Telescope have deduced the actual color of a planet orbiting another star 63 light-years away. HD 189733b, one of the closest exoplanets that can be seen crossing the face of its star, is believed to be a deep cobalt blue. But blue doesn't mean that the planet is like Earth. Instead, it is more like Jupiter in our solar system. That's because HD 189733b is among a bizarre class of planets called hot Jupiters, which orbit precariously close to their parent stars. The observations yield new insights into the chemical composition and cloud structure of the entire class. On this turbulent alien world, the daytime temperature is nearly 2,000 degrees Fahrenheit, and it possibly rains glass -- sideways -- in howling, 4,500-mph winds. The cobalt blue color comes not from the reflection of a tropical ocean as it does on Earth, but rather a hazy, blow-torched atmosphere containing high clouds laced with silicate particles. Silicates condensing in the heat could form very small drops of glass that scatter blue light more than red light. Hubble's Space Telescope Imaging Spectrograph measured changes in the color of light from the planet before, during and after a pass behind its star. There was a small drop in light and a slight change in the color of the light. "We saw the light becoming less bright in the blue but not in the green or red. Light was missing in the blue but not in the red when it was hidden," said research team member Frederic Pont of the University of Exeter in South West England. "This means that the object that disappeared was blue." Earlier observations have reported evidence for scattering of blue light on the planet. The latest Hubble observation confirms the evidence. Hubble and other observatories have made intensive studies of HD 189733b and found its atmosphere to be changeable and exotic. This plot compares the colors of planets in our solar system to exoplanet HD 189733b. The exoplanet's deep blue color is produced by silicate droplets, which scatter blue light in its atmosphere. Clouds often play key roles in planetary atmospheres. Detecting the presence and importance of clouds in hot Jupiters is crucial to astronomers' understanding of the physics and climatology of other planets. HD 189733b was discovered in 2005. It is only 2.9 million miles from its parent star, so close that it is gravitationally locked. One side always faces the star and the other side is always dark. 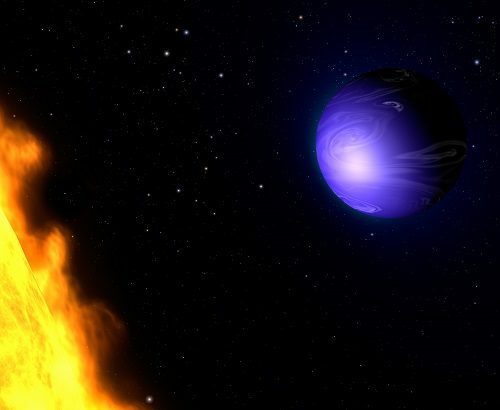 In 2007, NASA's Spitzer Space Telescope measured the infrared light, or heat, from the planet, leading to one of the first temperature maps for an exoplanet. The map shows day side and night side temperatures on HD 189733b differ by about 500 degrees Fahrenheit. This should cause fierce winds to roar from the day side to the night side.